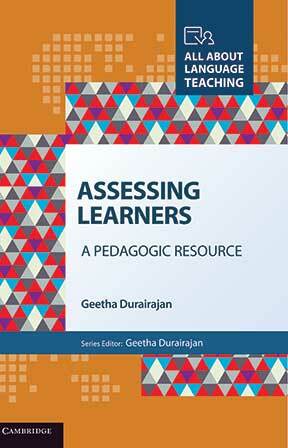 Assessing learners – A Pedagogic Resource by Geetha Durairajan is an essential part of an important series of books that aim to equip teachers in primary and secondary schools with appropriate professional training. It is a series targeted not just at the English language teachers but also at those who teach other subjects in English. Written in a lucid style, this book primarily deals with issues relating to evaluation, which is a critical component in assessing a learner. Evaluation, says the author, should be one that “enables learning”…”its purpose is not to certify or classify the child in any manner… evaluation has to be used to not just monitor and certify learning but to monitor the programme of education itself.” Explaining with an example, the author, a professor at the Department of Materials Development, Testing and Evaluation at the English and Foreign languages University in Hyderabad, feels that when we give our students some assignment/work in class, we must carefully observe and evaluate them as they are doing their work and note whether they have understood and learnt what has been taught to them. Based on this, we, which we are saying for the teacher here, could then decide whether to move on to the next unit, or go back and teach something again, or let the students spend more time practicing. The author discusses how we can use the knowledge we receive about a student from evaluating their test papers at various levels. Giving feedback to students and parents is certainly one use. (A subsequent chapter in the book discusses the importance of feedback and the different types of feedback.) According to the author, there are two kinds of evaluations: one, the “system-oriented tests” like the public examinations, and two the “teacher-managed tests” that help the child learn better and the teacher teach better. The book has an entire chapter dedicated to the CCE – Continuous Comprehensive Evaluation – and looks at its purpose and features apart from handling recording and reporting information. The author deals with subjects like different types of tests and discusses the difference between testing content and testing skills while emphasizing the need to write good questions for tests and examinations. Then, the author also talks about the difference between textbook exercises and test questions, subjective and objective type of questions. The book is not just a valuable resource for teachers but is quite timely. The only drawback is that it is text-heavy, although there are some illustrations to provide relief. But then, since this not a tome and is all packed into just 114 pages, one can surely live with this too. The reviewer is Senior Coordinator, Gitanjali Devashray. She can be reached at reachanjali@gmail.com. The book will be available in all leading bookstores in the country.